Mayor Alma Moron is seen behind the dais Wednesday at City Hall in La Villa. 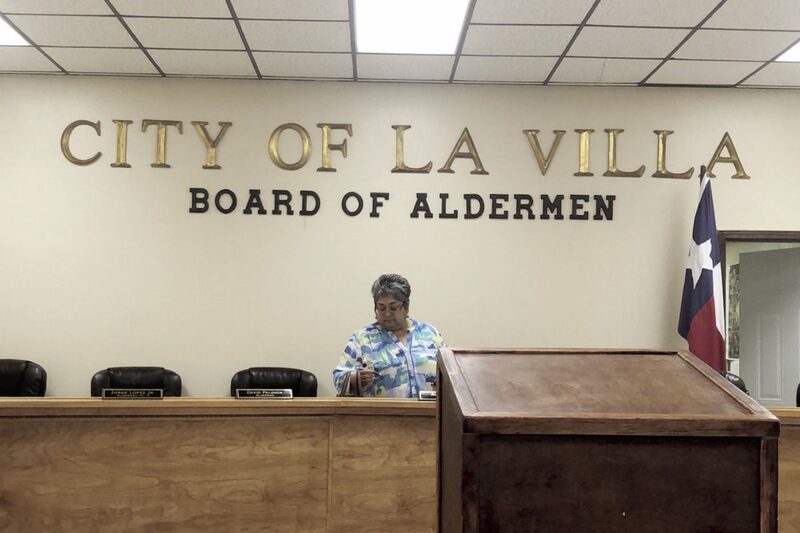 LA VILLA — Aldermen were a no-show at the regularly scheduled board meeting Wednesday — a week following a contentious move to raise the per diem rate for elected officials. Mayor Alma Moron, who said she missed one meeting since elected, was the sole attendee Wednesday evening. “Sometimes they do not (show up) when there’s controversial topics, or (when) there’s social media items going around that are not favorable to the board, they sometimes tend not to attend the meetings,” Moron said. Jose Martinez, a 21-year-old mass communication student at the University of Texas Rio Grande Valley, said he began attending meetings in 2014 as a junior in high school when the water surcharge debacle in the city left schools without running water for three days. He was the only resident Wednesday awaiting aldermen to arrive. “I wasn’t too sure if they were going to show up or not because of the whole story,” Martinez said referring to news of the board’s approval to raise the food and incidental expenses allowance from $150 to $250 per day for elected officials when traveling. “It was spreading around our town, so I had a feeling that maybe they were not going to show up,” he said. The board of aldermen, which meets on the second Wednesday of each month, were scheduled to get an update on the wastewater treatment plant, hiring of a police chief and two officers and listen to routine updates from city departments, among other agenda items. Representatives from Fulcrum, the engineering firm overseeing the city’s construction of the $4 million wastewater treatment plant, could not present due to lack of quorum. Reached by phone Wednesday night a couple of hours following the scheduled meeting time, Alderman David Palomin, who was elected in 2016, said he was “at a party.” Wednesday was his birthday. Meanwhile, Alderman Mario Lopez, a truck driver, said he was dropping off a shipment for work in North Carolina. Lopez said rumors were circulated about him actually being in town, which was not the case. Alderman Jorge Lopez, who previously declined to comment on the per diem rate last week, could not immediately be reached for comment about the lack of quorum. Alderman Joe Contreras, who was also absent from the special meeting held last week, said he could not attend because he was not in La Villa. Moron said she was aware that two alderman were not in the area due to work obligations. The board of aldermen will likely schedule a special meeting to discuss or take action on the 16 items listed under the regular agenda. While three aldermen need to be present at regularly scheduled meetings to meet quorum requirements, four are needed for special meetings. Moron said holding special meetings can be “very difficult” due to the requirement. Aldermen can be removed from the board if three consecutive regular meetings are missed. There are no attendance requirements for special meetings. “I hope they start serving the people instead of serving themselves,” Martinez said.